No particular observations for this simple operation. You need less than a liter of white vinegar. This percolator became too slow, partially clogged by scale. 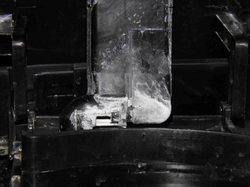 1- The scale can be seen on the cover’s hinge. 4- Add as much of white vinegar until full capacity is reached. 7- Put some vinegar on a kitchen towel and clean the surroundings by hand. 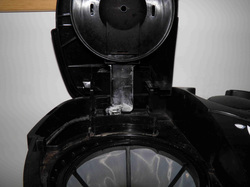 2- The scale goes all through the tube that brings water to the filter. 5- Turn On the machine. 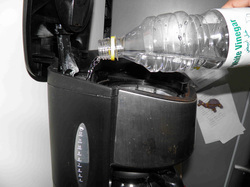 8- Refill with drinking water for at least half the capacity and run a new cycle for removing the vinegar taste. 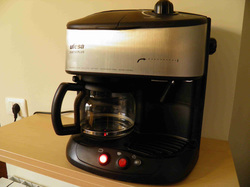 3- Fill half the capacity of the percolator with drinking water. 6- Wait until the cycle completes. 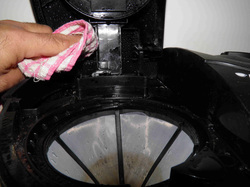 9- Now the tube is clean like the cover and the percolator is fast again.